Built in the 16th century for King Henry VIII, Bridewell Palace only had a short-lived life as a royal residence before it was handed over to the City of London and used as a poorhouse and prison. 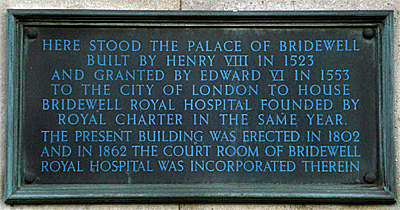 Located on the western bank of the Fleet River (the site is now occupied by Unilever House and remembered in the place names of Bridewell Place and Bridewell Court), the palace – named for a holy well located nearby which was dedicated to St Bride (St Brigid) – was built on the direction of the king’s key advisor Cardinal Thomas Wolsey between 1510-15 on land which had previously been the site of St Bride’s Inn. In 1515 Cardinal Wolsey gave it to King Henry VIII after taking up residence at Hampton Court and York Place – Henry was looking for a royal residence in London after the Palace of Westminister was largely destroyed in a fire in 1512. Work continued on the palace until its completion in 1523. 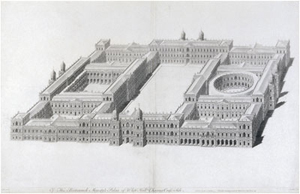 The palace, the site of which is now marked with a plaque on the approach to Blackfriars Bridge, consisted of two courtyards surrounded by brick buildings with the three storey royal lodgings (separate quarters for the king and queen) located around the inner courtyard and entered by a grand staircase from the outer courtyard. It also featured a watergate was located on the Thames and, interestingly, Bridewell was the first royal palace not to have its own great hall. Among historic events hosted here was the visit of the Holy Roman Emperor Charles V in 1522 (the emperor did not stay here but his entourage did). In 1528 meetings of the papal delegation took place at Blackfriars (located next door and joined by a specially built gallery) to discuss the king’s divorce from Queen Katherine of Aragon – it’s here that the Queen made her most famous speech declaring her fidelity to the king – and for its duration the king and queen lodged at Bridewell. It’s also said that it was at Bridewell Palace that artist Hans Holbein the Younger painted his famous work – The Ambassadors (see our earlier post on this here). 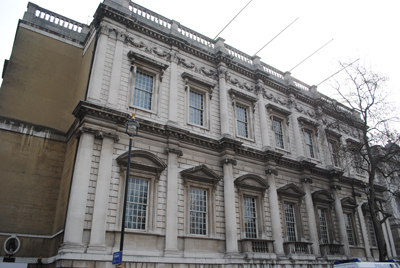 Following Cardinal Wolsey’s fall from favor in 1529, King Henry VIII no longer used the property (he took over the Palace of Whitehall, then known as York Place, as his main residence in 1530 – for more on this see our earlier post here). 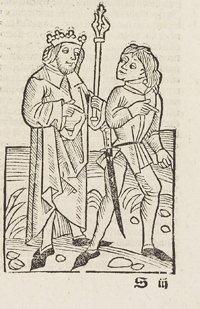 It was leased for much of the following decade to the French ambassador in London before, following petitioning for a new hospital for the poor from Nicholas Ridley, the Bishop of London, King Edward VI gave it to the City of London in 1553. They took over fully in 1556 and converted the palace into a prison, hospital and workrooms (we’ll deal in detail with the prison in an upcoming post).